Do you feel the Christmas mood already? It is only 20 days until Christmas and 26 days until New Year. Did you start to prepare Christmas and New Year gifts for your family and friends?! If not, it is a perfect time to start. 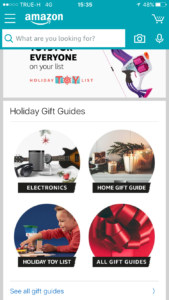 In this article we will introduce you with the best mobile apps that will make your Christmas and New Year shopping fun and organized and help you to find the perfect gifts for your loved ones. First, let’s start to prepare a gift list in order to not forget anything. This mobile app is must-have to keep everything under control for upcoming holidays. The Christmas Gift List app will help to not go beyond your budget, it let’s you to add people from the contact list and create a list of people whom you want to prepare a gift, form them into the groups (family, friends, co-workers), allocate a specific amount of budget for each person, track the level of readiness. 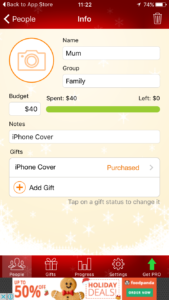 Moreover, the mobile apps offers a set of data visualization tools which will help easily to analyze who you left without a gift or for whom you need a gift idea, as well as gift shopping statistics in the form of charts. By using this mobile app you will make everyone happy and will save a lot of time for yourself. 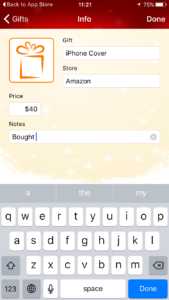 If you have have troubles with being creative, this mobile app will help you to find an idea for a gift. 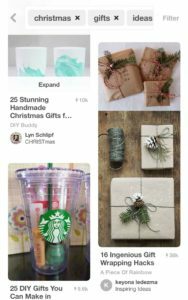 Pinterest is an immerse mine of inspiration. 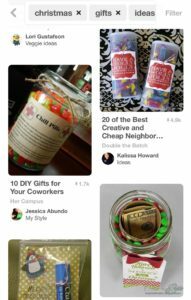 You can find gift ideas for any budget and taste. 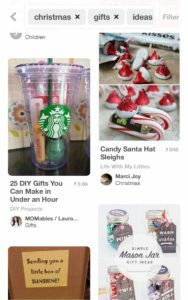 Pinterest offers thousand of ideas how to make a gift yourself for free. 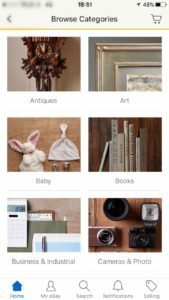 The mobile app lets to save ideas for later, and organize them by topic, collaborate with friends, search anything even if you don’t know what to search. Pump you up with inspiration for New Year and Christmas gifts. Shopping online is the best way to save time. 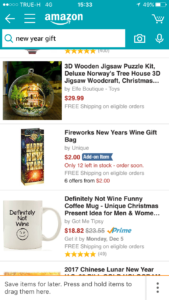 On amazon mobile app you can find anything, from selective wine for your father collection to a knitting machine for your grandmother. 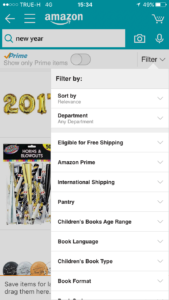 Amazon mobile app allows to get profitable product deals, read reviews from real customers, compare prices from different merchants, check the availability of the products. 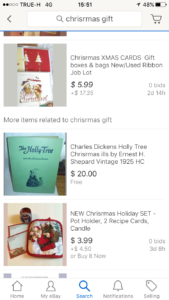 eBay is very similar to Amazon, with this mobile app Christmas and New Year holiday you will make happy everyone. On eBay you will get personalized recommendations and discover new ideas for the gifts. 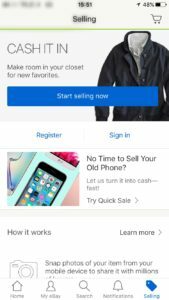 The mobile app offers great deals and special prices for upcoming holidays, bid on auctions function and great discount for top brands. If you are tight on budget, you can earn some money by selling things you don’t use anymore. You can easily track your orders, leave feedbacks, read and respond to messages. If you have your friends and family living far from you, it is not a reason to leave them on this special days without an attention. 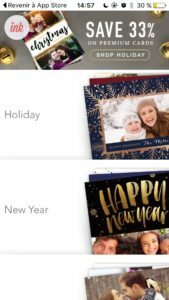 Ink Cards mobile app will allow you send a real fully customizable postcard to any country in the world. Additionally to a postcard you can add an embossed envelope or upgrade your postcard to a thicker matte card. 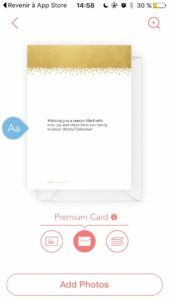 Customize your card with your own pictures, emoji and signature. The price of each postcard starts from $1.99 including postage. 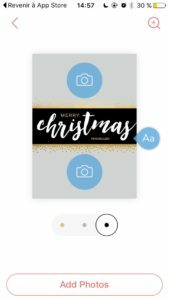 Ink cards mobile app will deliver your postcard anywhere in the world within 2-3 weeks, an estimated delivery time around Europe, UK, US and Canada is just 2-8 business days. Don’t forget anyone to congratulate with upcoming holidays.